Apoptosis plays an important role in the regulation of healthy tissue growth and development as well as in controlling the maintenance of homeostasis in exercising muscles. During an intensive physical effort, the regulation of cell death by apoptosis results in the replacement of unaccustomed muscle cells by new cells that are better suited to exercise. The aim of this study was to determine the expression of two genes (SH3FR1 and SH3RF2) that control apoptosis in muscle tissues during training periods characterized by different intensities. The gene expression levels were estimated using real-time PCR method in skeletal muscle biopsies collected from 15 Arabian horses (untrained, after an intense gallop phase, and at the end of the racing season). An association study was performed on 250 Arabian horses to assess the effect of the SH3RF2:c.796 T > C (p.Ser266Pro) variant on race performance traits in flat gallop-racing. A gene expression analysis confirmed a significant decrease (p < 0.01) in the anti-apoptotic SH3RF2 (POSHER) gene during training periods that differed in intensity. The highest SH3RF2 expression level was detected in the muscles of untrained horses, whereas the lowest expression was identified at the end of the racing season in horses that were fully adapted to the exercise. A non-significant decrease in SH3RF1 gene expression following the training periods was observed. Moreover, a serine substitution by proline at amino acid position 266 (CC genotype) was negatively associated with the probability of winning races, the number of races in which a horse occurred and the financial value of the prizes. Horses with the TT genotype achieved the highest financial benefits, both for total winnings and for winnings per race in which the horses participated. The present study showed the supposed regulation mechanism of exercise-induced apoptosis in horses at the molecular level. The identified SH3RF2: c.796 T > C missense variant was associated with selected racing performance traits, which is important information during the evaluation of horses’ exercise predisposition. The association results and frequencies of the CT and TT genotypes suggest the possibility of using SH3RF2 variant in selection to improve the racing performance of Arabian horses. Biological processes that occur in the body during exercise have been widely studied in terms of the physiological response and muscle adaptation to demand. Skeletal muscle adaptation during intensive training occurs through modification of the metabolic rate, the regulation of oxygen uptake, the production of lactate and the usage of energy from various sources, such as glycogen or fat . Skeletal tissue remodelling is another adaptation mechanism related to exercise, fitness, and muscular strength . Exercise can induce an increase in muscle cell size (hypertrophy)  and the number of fibres (hyperplasia)  or lead to the transformation of fibre types . Furthermore, several reports have shown that one of the processes related to the adaptation to the training is apoptosis or programmed cell death [6, 7]. Apoptosis plays an important role in the regulation of healthy tissue growth and development, is critical during ageing and in some diseases, and controls the maintenance of homeostasis in the exercise muscle . Research performed on rats has shown that physical activity is associated with the intensity of the apoptotic processes in both skeletal and cardiac muscles . In thoroughbred horses, Boffi et al. confirmed that the training induces apoptosis in skeletal muscle. The authors hypothesized that the regulation of cell death by apoptosis results from the replacement of unaccustomed muscle cells by new and stronger cells that are better suited to the exercise. In Arabian horses, a whole transcriptome analysis of muscle tissues showed a significant down-regulation of several genes during training periods of different intensities, but the expression of only one gene, SH3 domain containing ring finger 2 (SH3RF2 previously known as POSHER), was lower throughout all training points in untrained animals compared to fully exercise-adapted horses . The comparison of muscle transcriptomes between horses in different training periods enabled the identification of differentially expressed genes that are likely related to an adaptation to exercise intensity . The next stage of the research should be the verification of the selected gene’s association with the performance features via the identification of variants with a potential effect on gene expression as well as on protein activity and function. SH3RF2 encodes an E3 ubiquitin-protein ligase (SH3 Domain Containing Ring Finger 2) that, together with its homologue (POSH; SH3RF1), regulates the intensity of apoptotic processes via modification of JNK signalling . The SH3RF2 protein is considered to be an anti-apoptotic factor, the overexpression of which leads to a decrease in apoptosis promotion . On the other hand, the decrease of SH3RF2 content promotes stabilization of its homologue – SH3RF1 and, via activation of the JNK cascade induces apoptosis of multiple cell types . The SH3RF1 as pro-apoptotic protein induces JNK activation and cell death and together with SH3RF2 protein determine a dynamic mechanism that regulates apoptosis in cells [11, 12]. The recent report showed also that SH3RF1 acts as a negative post-translational regulator of atypical cadherin 1 (FAT1) essential for controlling cell proliferation . The aim of this study was to determine the exact expression level of both the SH3RF1 and SH3RF2 genes in muscle tissues during training periods characterized by different intensities. The second part of the presented research focused on estimating the possible effects of a variant within the SH3RF2 (POSHER) locus on race performance traits in flat gallop-racing. The expression of two genes, SH3RF1 and SH3RF2, in muscle were estimated (m. gluteus medius) from samples that were collected from 15 unrelated pure-bred Arabian horses: 5 untrained horses (2.5-year-old horses) and 3-year horses during a one-year training period preparing for flat races at two time points (after an intense gallop phase, n = 10; at the end of the racing season, n = 8). The exact training procedure and points of muscle collection were described previously . Muscle biopsy was performed using a ProMag™ Ultra Automatic Biopsy Instrument (Argon Medical Devices, Inc., Creek Road, USA) with a 2-mm-diameter biopsy needle according to the procedure described by Stefaniuk et al. . The experimental protocol was approved by the Animal Care and Use Committee of the Institute of Pharmacology, Polish Academy of Sciences in Cracow (no. 1173/2015). The horses’ owners gave consent to be part of this study and allowed for maintaining all research procedures on animals. Total RNA was isolated using TriReagent, and the RNA quality and quantity were determined using a TapeStation 2200 instrument (Agilent Technologies, Warsaw, Poland) and RNA Screen Tape (Agilent Technologies). RNA samples (300 ng each) with RIN values above 8.5 were reverse transcribed to cDNA using the High-Capacity RNA-to-cDNA Kit (Applied Biosystems, Thermo Scientific, Waltham, Massachusetts, USA). The expression levels of both genes were detected on a Quant Studio 7 flex real-time PCR system (Applied Biosystems) using AmpliQ 5× HOT EvaGreen® qPCR Mix Plus (ROX) (Novazym, Poland) in 3 replicates for each sample. The primers for the targeted genes and endogenous controls (GAPDH and B2M)  were designed using Primer3 version 4.0.0 based on the Ensemble reference sequence (Additional file 1: Table S1). The primers for SH3RF2 gene were not affected by the identified c.796 T > C missense variant. The PCR efficiencies were estimated based on the standard curve method, and the normalization factor (NF) was calculated based on the geometric mean of the normalized quantity of the two endogenous genes (GAPDH and B2M). The relative quantities of the analysed genes were calculated using delta-delta Ct according to Pfaffl . The differences between training periods in the expression levels were analysed using SAS software (SAS Institute, Cary, NC, v. 8.02, 2001). The normality of the distribution was tested using the Shapiro-Wilk test, and differences between the groups were analysed using the Kruskal–Wallis test. The association study was performed on 250 pure-bred Arabian horses, from which biological material was collected as blood or hair follicles. The analysed Arabian horses were the offspring of 93 stallions (an average of 2.68 individuals per father) and 206 mares (an average of 1.21 individuals per mother). All 3- to 5-year-old horses had taken part in flat races at distances ranging from 1400 to 3000 m. The racing performance traits considered were wins by taking 1st, 2nd or 3rd place and the total number of wins from 1st to 3rd places, the number of races in which the horse participated, and the financial benefits obtained by the horses (wins resulting in money). Based on RNA-seq data previously obtained from Arabian horse blood and muscle transcriptome sequencing (GEO databases: GSE83404; GSE88951), all of the coding sequences and 3′ and 5’ UTR regions were screened to detect polymorphisms. DNA was isolated using the Sherlock AX DNA Isolation kit (A&A Biotechnology, Gdynia, Poland). Next, the PCR-RFLP method was applied to genotype the only identified mutation, the ENSECAT00000026355.1:c.796 T > C missense variant (ss#2137535205; rs396219497). A 479-bp fragment of the SH3RF2 gene (F TTTTTAGCCCCTTTGGACCT; R GGTGCTGATCTCCACCATTT) was amplified using AmpliTaq Gold® 360 Master Mix (Thermo Scientific) according to the protocol with a 57 °C annealing temperature. The PCR products were digested using the BtsCI endonuclease and the obtained fragments were allele T - 289, 151 and 39 bp and allele C – 440 and 39 bp. The associations between the identified mutations and racing results were estimated using the GLM procedure in R software (R version 3.4.4). The exact mechanisms and effects of exercise-induced apoptosis on the maintenance of body homeostasis and adaptation to training are still unclear. Siu et al. indicated that during exercise, cell death can be activated by reactive oxygen species. Oxidative stress can damage the mitochondria and affect mitochondrial-mediated apoptosis. On the other hand, apoptosis can be an important mechanism that protects muscles from damage and controls myoblast proliferation through muscle regeneration . Phaneuf and Leeuwenburgh  hypothesized that training-induced apoptosis is a regulatory process that is intended to remove certain damaged cells without causing a distinct inflammatory response. There is very little information on the occurrence of the apoptotic process in the muscles of exercising horses. Boffi et al. inferred that apoptosis has an important role during muscle remodelling and fitness maintenance in thoroughbred horses. The authors confirmed the occurrence of the apoptotic process in gluteus medius muscles and found that it was related to the programmed death of cells unadapted to exercise conditions and their replacement by new cells that are more suited to the increased physical effort. Furthermore, our previous study showed exercise-induced de-regulation of gene expression related to programmed cell death of the genes SH3RF2, BCL2, and ANKRD2 . These findings confirm the association of the apoptotic processes during muscle adaptation to training. The use of a precise, real-time PCR method allowed us to confirm the significant decrease (p < 0.01) of the anti-apoptotic SH3RF2 gene in the muscle tissue of Arabian horses during training periods that differed in intensity. The highest SH3RF2 expression level of the SH3RF2 gene was detected in muscles of untrained horses, whereas the lowest expression was identified at the end of the racing season in horses that were fully adapted to exercise (Fig. 1). Our results also showed a decrease in SH3RF1 gene expression following the training periods, but this difference was not significant (Fig. 1). A significant and more than 5-fold decrease of the anti-apoptotic SH3RF2 gene in muscles adapted to training compared to untrained tissue might indicate that exercise-induced apoptosis can be a physiological response mechanism essential for fitness maintenance in horses. However, the association of SH3RF2 with adaptation to exercise should be confirmed at the protein level, which will provide full information about the regulation of an investigated anti-apoptotic factor during physiological effort. Boffi et al. suggested that in thoroughbred horses, apoptosis can be a natural mechanism that regulates muscle strength as opposed to necrosis, which is evidence of overtraining. It is assumed that exercise-induced apoptosis is promoted by the up-regulation of pro-apoptotic genes and/or the down-regulation of anti-apoptotic genes [6, 17]. The decrease in SH3RF2 gene expression observed in the present study supports this thesis and suggests which molecular pathway might be involved in the regulation of apoptosis following exercise. The anti-apoptotic function of SH3RF2 is based on SH3RF1 degradation because it is a pro-apoptotic protein. On the other hand, a decrease in the SH3RF2 protein level in cells leads to SH3RF1 stabilization as a result of activation of the JNK signalling pathways and apoptosis . Moreover, Kim et al. showed that POSHER (SH3RF2) can control actin cytoskeleton modification by mediating PAK4 protein stability. 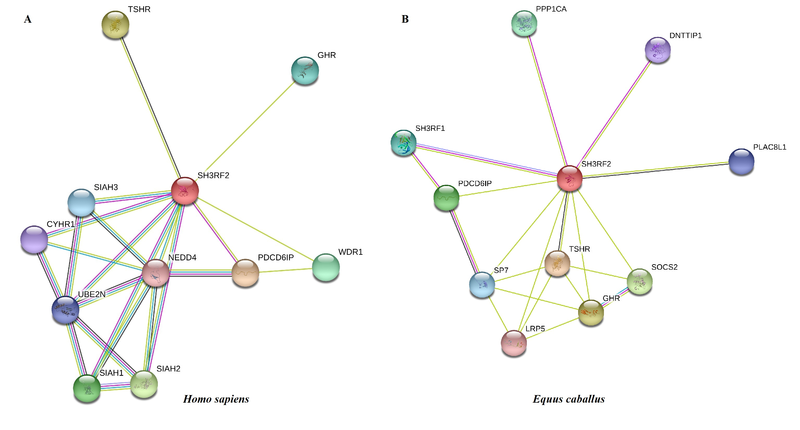 The interaction networks of the SH3RF2 protein created using the String Database based on Equus caballus  indicated that SH3RF2 is associated with growth hormone receptor (GHR), thyroid stimulating hormone receptor (TSHR) and programmed cell death 6 interacting protein (PDCD6IP) (Additional file 2: Figure S2B). Additionally, it has been experimentally determined that human SH3RF2 is related to SH3RF1 (POSH)  and protein phosphatase 1 (PPPC1A)  (Additional file 2: Figure S2A). Gesing et al. confirmed that Ghr-null mice have a delayed ageing process and prolonged longevity. Moreover, in vitro studies showed that an increase in TSHR gene expression can lead to apoptosis activation . Such findings suggest that SH3RF2 can control programmed cell death not only by regulation of SH3RF1 but also via other molecular pathways. The gene expression data obtained in the present study suggested that the SH3RF2 gene can be a principal factor for controlling exercise-induced apoptosis. Therefore, the next step was to evaluate the possible interactions of detected polymorphisms and racing performance traits. Based on RNA-seq data, a missense variant ((SH3RF2:c.796 T > C:(p.Ser266Pro)) affecting a conserved residue was detected.. Equine SH3RF2 (UniProtKB - F6YV64) contains 4 domains: one RING-type domain and three SH3 (src Homology-3) domains that are responsible for protein-protein interactions in signal transduction pathways . The p.Ser266Pro substitutionis localized in the gene region encoding the protein fragment between the second and third SH3 domain (253 to 382 amino acids). Genesilico Metasever  based protein comparisons showed that the SH3RF2:c.796 T > C variant possibly affect protein structure and function. The missense variant was associated with the secondary structure of the protein through differences in the alpha helix and beta strand patterns between wild type and mutant proteins (Additional file 3: Figure S2). The amino acid substitution might also modify the protein solvation, as presented by the ratio of the solvent-accessible surface area of the residues observed in the protein structure to that observed in an extended tripeptide (Gly-X-Gly) conformation according to different prediction methods, including two the most common: SPINE  and SABLE  (Additional file 4: Figure S3). Generally, the differences in both the secondary structure and solvation are critical during three-dimensional protein folding and can affect the final form of the protein and its function [27, 28]. Thus, we hypothesized that the identified c.796 T > C variant influences the function of the SH3RF2 protein and, as a result, determines selected phenotypic traits related to adaptation to exercise. The research performed in chicken and cattle indicated on possible role of SH3RF2 on growth in both species. In chicken, Rubin et al. detected a deletion within SH3RF2, which was present at low frequency in a low-growth line and could be the causative mutation for body weight. Moreover, Hanotte et al. showed that bovine SH3RF2 gene is localized near to the QTL region associated with body weight and was proposed as one of gene located within the selection signature region in French beef cattle . Analysis of the SH3RF2:c.796 T > C genotype frequencies showed that the most frequent were horses with CC (47.7%) and TC (43.7%) genotypes, whereas TT homozygotes accounted for 8.6%. Our results showed a significant association of the missense variant in the SH3RF2 gene and racing results in Arabian horses. The serine substitution by proline at the amino acid 266 position (CC genotype) was negatively associated with the probability of winning races, the number of races in which horses occurred and financial benefits obtained in prizes. Horses with the TT genotype won significantly more often (p < 0.05) in competition that horses with the other genotypes (Table 1). Furthermore, TT horses won the most financial benefits, both in regard to total winnings and in winnings per race in which the horses participated. The opposite results were obtained for CC homozygote horses and heterozygotes obtained intermediate values (Table 1). The significantly better racing results observed for homozygotes horses with the wildtype T alleles compared to CC horses might indicate that amino acid substitution is related to impairment of the function of the SH3RF2 protein. The presented association of the SH3 domain, which contains a ring finger 2 gene, and performance traits is a novel finding in horses and has not been reported in humans or other species to date. Reports from various authors confirmed the important role of both SH3RF1 and SH3RF2 in apoptosis [11, 12] and body growth [29, 30]. On the other hand, Kim et al. did not detect a significant role for the SH3RF2 gene in myoblast differentiation in in vitro studies in quail myoblast cells. The skeletal muscle SH3RF2 gene expression profile during a long-term training cycle indicated that this gene is related to exercise adaptation to training and fitness maintenance, probably via regulation of the apoptotic processes. The identified SH3RF2:c.796 T > C missense polymorphism was associated with selected racing performance traits, which will be essential information during the evaluation of horse exercise predisposition. In addition, previous reports have shown that performance heritability for flat gallop racing is from 0.15 to 0.55 [33, 34]. This high heritability indicates the possibility of improving the exercise phenotype by genetic selection over a relatively short time period. In the present study, the worse racing results obtained for CC homozygotes clearly indicated that the c.796 T > C SNP was negatively associated with the function of the SH3RF2 protein. The reported association results and the frequencies of the TC and TT genotypes suggest the possibility of utilizing this polymorphism in selection to improve racing performance in Arabian horses. Furthermore, future research should establish the potential association of SH3RH2 with an exercise phenotype, for example sprint, endurance or strength types of predisposition to effort in horses of different breeds. The usage of the identified SNP in selection could allow the improvement of performance features and the maximization of results by the selection of training according to individual horse predisposition. The authors would like to thank the horses’ owners their collaboration. The study was supported by the National Science Centre (project no. 2014/15/D/NZ9/05256). KRM contributed to all steps, designed the study, analysed the data, and drafted the manuscript. MSS contributed to the collection of biological material as well as writing and critical revision of the manuscript. KP contributed to the genetic analyses and critical revision of the manuscript. TSZ contributed to data analysis and critical review of the manuscript. MBP contributed to data analysis and critical review of the manuscript. All of the authors read and approved the final manuscript. The protocol was approved by the Animal Care and Use Committee of the Institute of Pharmacology, Polish Academy of Sciences in Cracow (no. 1173/2015). The horses’ owners gave consent to be part of this study and allowed for maintaining all research procedures on animals. The constant was obtained verbally which approved by Ethics Committee.